RoomsBook.net. Book your hotel now. Available on thousands of hotels in Sri Lanka. Terms and conditions on how to use this card is govern by the terms and conditions stated in the policy of www.Roomsbook.net (Pvt) Ltd. 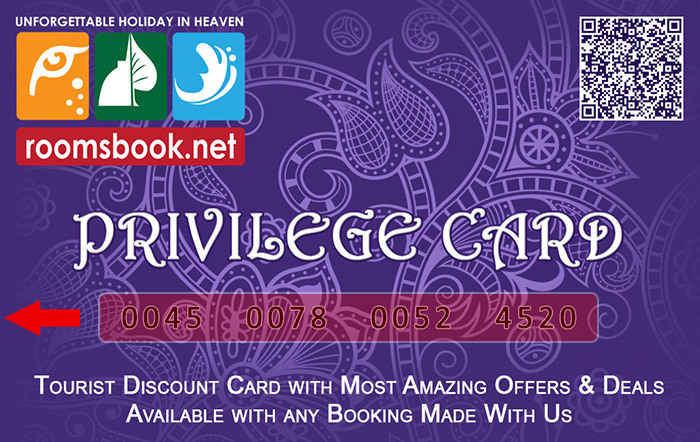 This card must be presented at the times of use to the agent/guide of www.Roomsbook.net(Pvt) Ltd.
Privileges provided by this card can be changed without any prior notice by the authority of www.Roomsbook.net(Pvt) Ltd. This is not a credit, debit or charge card. This card can be used during unlimited journeys only by you or any of your family members or friends. You may transfer your card to your family member or your friends after giving prior notice to roomsbook.net. If found please return this card to www.Roomsbook.net(Pvt) Ltd. This is a lifetime membership card which is valid from the date of issue. Should be notified immediately of the loss or theft of this card. Replacement cost of each lost card is $10.00 USD. All material contained herein are © 2013 - 2019 www.Roomsbook.net (Pvt) Ltd., All Rights Reserved.